Video shows damage in Baba Amr Jump to media player A Red Cross convoy is on its way to the Baba Amr area of the Syrian city of Homs to deliver food and medical supplies after a month-long siege. How Syrian activists get message out Jump to media player Two Syrian activists talk about their efforts to get footage of the government crackdown out of the country. 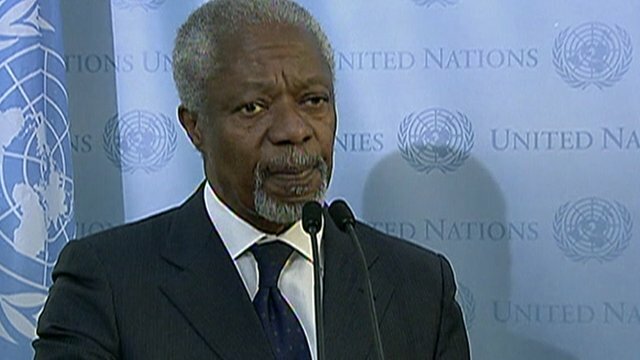 'One voice' vital to Syrian talks Jump to media player Kofi Annan has urged the importance of the international community speaking "with one voice" if it is to have an impact on the Syrian regime. A Red Cross convoy is on its way to the Baba Amr area of the Syrian city of Homs to deliver food and medical supplies after a month-long siege. 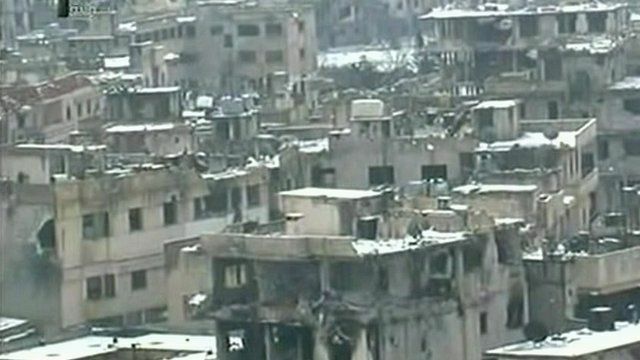 Footage broadcast on state TV on Friday showed scenes of destruction in the Baba Amr district of Homs. Snow has also been falling in Syria since Thursday and state TV showed pictures of the scene in Homs. Footage from activists said to have been filmed on Thursday also appeared to show residents in the streets of Bab Sbaa in Homs.